to a local park & took these AMAZING photos. I should hang on my living room walls. I will give you her email address. 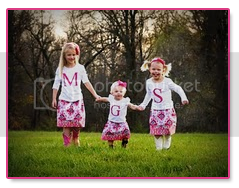 Then you can get some AMAZING family photos of your own! LOVE them!!!! Beautiful family! I can't decide which one is my favorite! All of them turned out great! My favorite one of the girls is the color one (the 3rd to last picture). And, I just love all of them with the 5 of you! I agree with everyone else. HANG. ALL. OF. THEM. Beautiful! Marta they are all gorgeous! I don't know how you'll choose. She did a beautiful job. Love ALL of them as well. What a beautiful family. You and your family are beyond gorgeous, Marta!! wonderful pics. wonderful!!!! what a cute family. Marta, I love you and your gorgeous family! what a beautiful family and i love your blog. would you share where you got all of their cute outfits...love them and i have twin girls...always looking for more cute clothes for them.